By Wednesday evening storm Caroline will be blowing heavy south westerly winds and dumping copious amounts of rainfall along with snow on the islands. As Caroline strengthens over the North Sea on Thursday and Thursday night, damaging winds will be unleashed farther north across Scotland and Northern England. 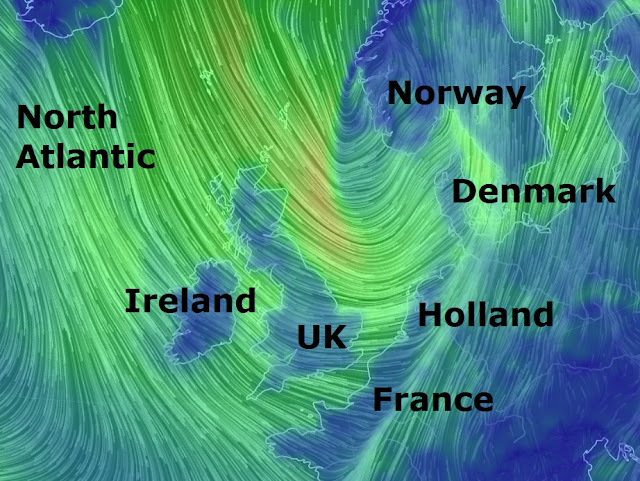 "Widespread wind gusts of 80-100 km/h (50-62 mph) are expected with locations in northern and western Scotland at risk for peak wind gusts of 130-145 km/h (81-90 mph)," said AccuWeather Meteorologist Tyler Roys. These powerful winds will result in power outages across the region. “Impacts across Scotland and Northern England will also include snow in the highest elevations and widespread disruption to travel including ferry, air and rail travel,” said Roys. Wintry showers will be confined to Scotland, Northern Ireland, northwestern England and northern Wales on Saturday as the arctic chill remains entrenched across the country. "Some low elevation locations can expect 2-5 cm (1-2 inches) of snow from Friday into Saturday," said Roys. Another storm system will approach on Sunday and could bring additional wintry precipitation to parts of the country.